Centered between the Pacific Ocean and Coronado Bay, Loews Coronado Bay Resort epitomizes the true Southern California lifestyle. We are pleased to announce completion of a comprehensive redesign of our lobby, Bay Terrace, Cays Lounge, Market Cafe and Market-To-Go. Taking full advantage of the waterfront location, the new design artfully combines San Diegos sun and surf with the casual charm of southern California. Loews Coronado Bay Resort offers activities as varied as our guests. Relax by one of three pools, stroll down the pristine Silver Strand State Beach, pamper yourself at Sea Spa or just enjoy a glass of wine while sitting at an outdoor fire feature watching the sunset. Other resort recreation includes bayside tennis courts, a private marina with bike rentals and a fleet of gondolas and a full-service spa and salon. Our 439 rooms include 37 suites and are all designed to fit your specific needs, whether those needs be spacious rooms perfect for families or flexible work areas ideal for business travelers looking to get work done while traveling. All guest rooms feature free wi-fi, in-room safe, a Keurig coffeemaker, Julien Farel professional hair dryer, flat screen television and 24-hour room service. Mistral: Mistral offers a global-fusion menu highlighting Mediterranean flavors. Robust flavors are prepared with innovative techniques then infused with herbs fresh from the resorts garden. Enjoy this delectable menu surrounded by views of the glittering San Diego skyline and sunsets over the Pacific. Market Cafe: The completely transformed Market Cafe offers a whimsical design inspired by its unique waterfront location, taking full advantage of the stunning marina views. The all-new menu offers breakfast, lunch and dinner options showcase the culinary variety of Southern California. Market To Go: Features made-to-order Starbucks Coffee drinks as well as gourmet pastries, handcrafted sandwiches and salads. For the sweet tooth, ice cream and housemade waffle cones, a wide selection of local gourmet snacks and commemorative gifts are available. 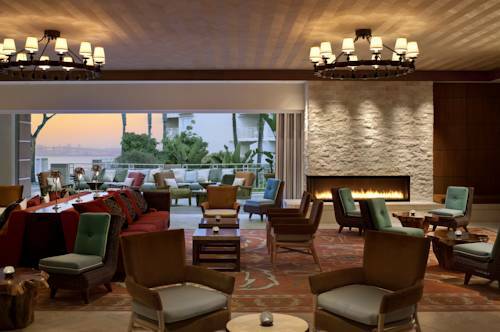 Cays Lounge: Breathtaking views of the skyline and Coronado Bay along with craft cocktails and local craft beers. Outside oversized teak sofas beckon guests to cozy up to stylish fire pits for a warm glow in the evening hours. La Cantina: Casual poolside dining at La Cantina allows you to relax by one of our three pools while our bartenders mix your favorite libations or pour you one of our local craft beers on tap. Loews Coronado Bay is situated within the seaside community of Coronado on Crown Isle, a private 15 acre peninsula. The resort is surrounded by water, with rooms offering views of its private marina, the Pacific Ocean, Coronado Bay Bridge and the San Diego skyline. The property is adjacent to the Coronado Cays residential community, four miles from downtown Coronado and 15 miles from San Diego International Airport.